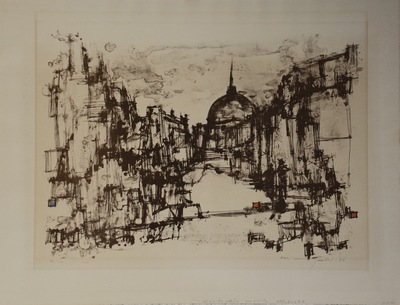 Born in Zurch, Switzerland, in 1934, this immensely succssful young artist ahs studied his trade since the age of 16. He has lived in Zurich, Paris, London, and currently resides in Rome wehere he shows at the Gallery 88. His subjects are ships - idealized, mysterious ships, and cities - luminous, rainwashed - the very essence of cities. His compositions are a live with people, sometimes merely suggested with a few deft lines and sometimes left only to the viewer's imagination, but always alive. His universal appeal is attested to by the speed with which his works disappear into the hands of collectors both novice and sophisticated, In Europe and America.